Seeds of date palm trees are becoming one of the nature solutions for pollution as their interesting adsorption properties can compete with other conventional adsorbents such as activated carbons. In the Middle East, where massive amounts of palm pits are being disposed daily, researchers are interested in exploit these waste in beneficial applications such as water treatment from toxins. 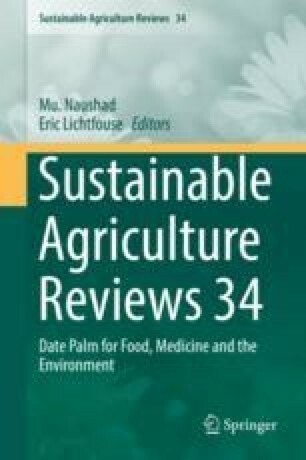 This chapter is reviewing the latest research that investigates the possible routes of extracting useful substances from palm dates including oil, cellulose and phenol. It also focuses on the chemical composition, surface morphology and microstructure of the treated palm seeds. Such remarkable properties reflect the outstanding behavior of the extracts during adsorption experiments. It is discussed here, how palm seeds can be effectively applied in heavy metal (Cu, Pb, Zn, Cr, Au, Br and Ni) removal from aqueous solution. Degradation of dyes (Rhodamine B (RhB), Methylene blue (MB), Congo red (CR) and Crystal violet (CV)) and other pollutants are also considered under different experimental conditions.